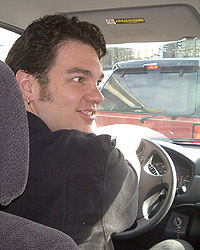 Left: David Hahn drives from Portland to Seattle at speeds in excess of 100 mph, cackling maniacally the entire time! His passengers, Matthew Clark and Paul Guinan, are in constant fear for their lives. 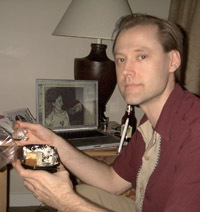 Below: Paul calms down in the hotel room that night with some cheesecake, generously provided by the equally traumatized Matthew. 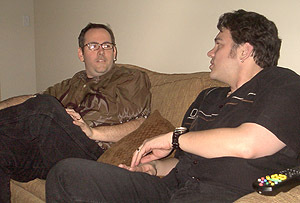 Left: Pete Woods patiently explains to David that life is not like comic books, and that he shouldn't drive like he’s in a chase scene. Finally, just before dawn, David vows never to drive faster than 80 mph. 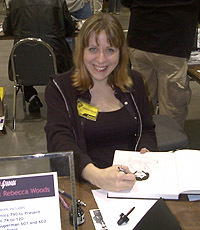 Below: The ever-effervescent Rebecca Woods, on the morning of the con. 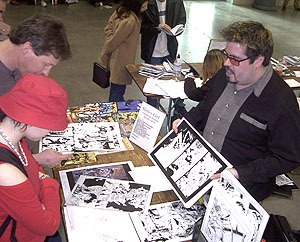 Left: Matthew Clark talks with fans. 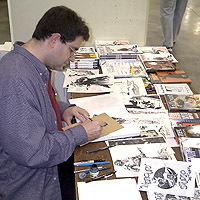 Above: Steve Lieber works on con sketches classically rendered with pen, brush, and ink. 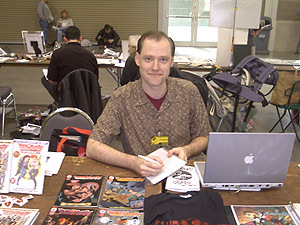 Left Paul Guinan works on con sketches electronically rendered with a stylus, tablet, and laptop. 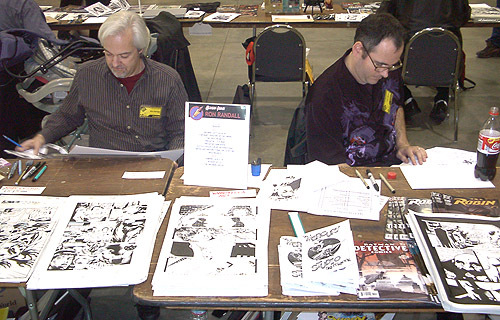 Above: Ron Randall and Pete Woods display and sell their original artwork. For info about buying art by any member of Mercury Studios, please contact us. 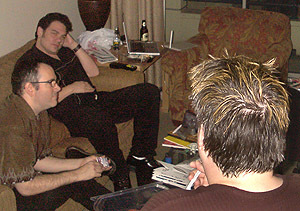 Below: The Official Mercury Studio Seattle Convention Dinner, held in a private room at The Islander resturant. Famous for its high-quality Polynesian food and unique cocktails, served in an upscale tiki setting. Matthew "Mad Dog" Clark, Pete "Doc" Woods, Rebecca "Smiley" Woods. Behind the camera: Paul "Sparks" Guinan. Drew "Babyface" Johnson, Karl "Cook" Kesel, Terry "The Kid" Dodson. 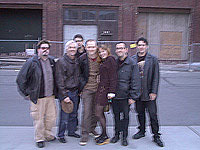 Here’s a photo of the gang outside our newly acquired building, just a few blocks south of Pike Place Market, off First Avenue. It’s been gutted and is undergoing extensive renovation. We plan to make it the most luxurious studio imaginable!